There are so many things wrong with this photo and there are so many things that I LOVE about this photo. Most people would dump it because you have been taught that you possibly don't have the time to scrapbook poor photos like this. Well I don't scrapbook any more and I get to do what I want. This is a keeper for me. Would this have been the perfect shot if she was in focus? Maybe. What was my focus point doing in the WAY bottom? I have no idea - I don't ever move from the center focus point. I do know that my real point is she is four - she has the energy of a rechargeable battery. Most of my shots of her are blurry. Unless I specifically ask for a photo - then I get that constipated smile. [You know the one I am talking about] This represents her right now - moving, even both of her feet are up in the air, oh the joy! 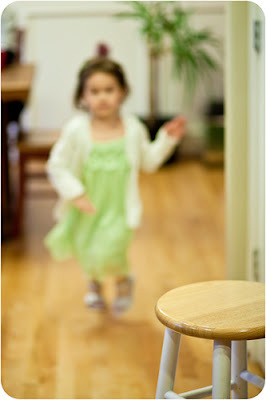 The stool represents the calmness that she experiences for short moments - when you are four. These types of photos are keepers - whether you scrapbook them or not, whether you have time, whether you have space on your hard drive. Keep these. Then when you are drained at the end of the day wondering where your energy went...remember when you were four, moving so fast that your feet never touched the ground.